Lunteren is a small town of just over 12000 inhabitants in the Province of Gelderland in central Holland where between 2010 and 2011 tile panels were placed on the exterior of buildings as a form of public art. 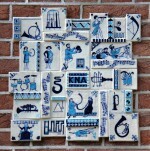 The ‘tile route,’ as it is now known, consists of a series of 38 small tile panels on the facades of local buildings and was the result of a partnership between local artists, Lunteren Parish Council and the Dutch National Tile Museum in nearby Otterlo. The panels have been specially designed to match specific buildings, such as shops, houses or public buildings either by marking and celebrating the activities carried out there or commemorating famous local people or making passers-by aware of the history of the building. The scheme was started in 2010 by the artist Marieke Bouman who, with a group of local artists created fifteen tile panels for various locations in Lunteren. This has since expanded to 38 panels and the project is still ongoing and is actively supported by the local population. 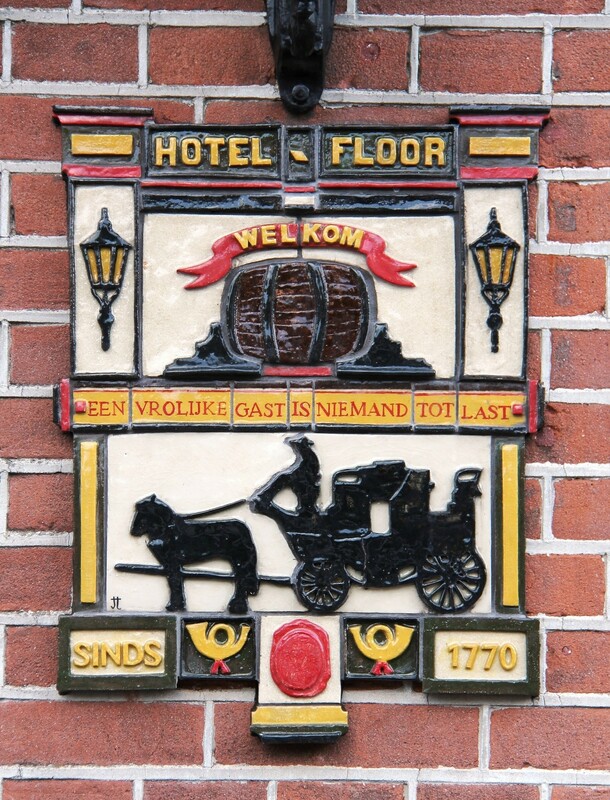 The majority of the tile panels are situated on buildings along the Dorpsstraat which is the main road through Lunteren. Although the initial idea was that all the panels would be made by local artists in Lunteren, not all local artists had the necessary experience of working with ceramic tiles so ceramic artist from outside Lunteren (like Frouwien Soenveld) were invited to participate in the scheme and pass on their practical experience of working with ceramic tiles. The panels have been designed in consultation with the owners of the buildings and the involvement of so many different artists ensures a variety of different stylistic approaches which help to give this tile scheme great breadth and diversity of subject matter, form and colour. Many panels have been placed on the outside of shops and denote what kind of trade is carried on there such as cheerful ice cream cones for an ice cream shop, flowers for a florist’s shop, or a camera for a photographer’s and the panels help to enliven the shops’ facades. 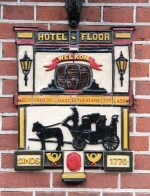 Other panels depict the history of a particular building such as the Hotel Floor that has been looking after travellers since 1770 or the house on Dorpstraat 84 that used to be a dairy and now has a tile panel in the shape of a milk churn covered in smaller motifs celebrating the milk trade. 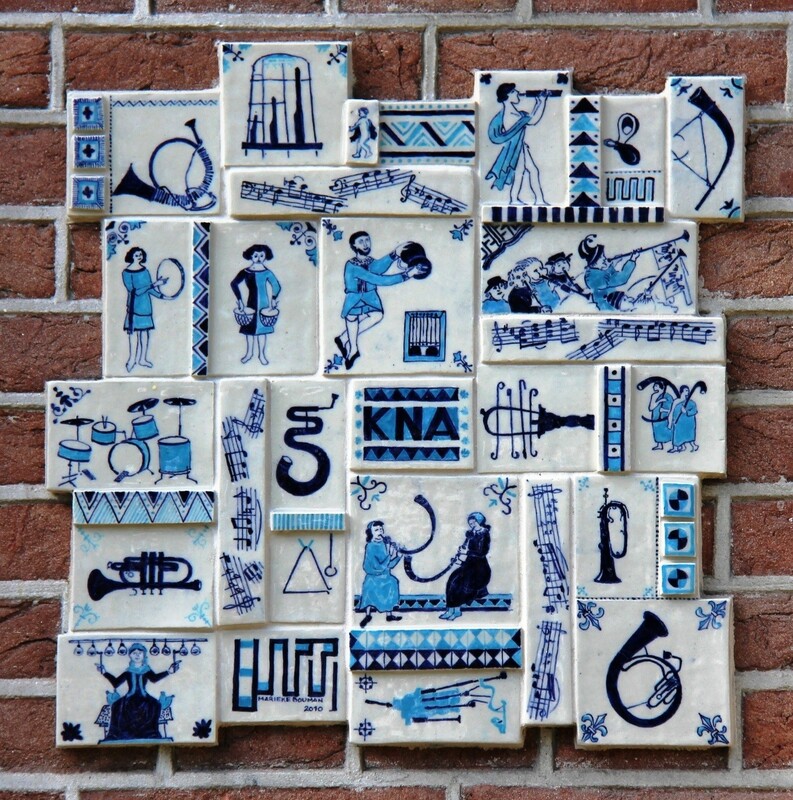 The initiator of the tile trail, Marieke Bouman designed an intricate panel of multiple tiles with musicians and musical instruments for the exterior of the music centre KNA (Kunst na Arbeid) meaning ‘Art after Labour’ that has been the home of a nationally famous small orchestra since 1904. The tiles are a playful ensemble showing musicians playing various kinds of instruments as well as single instruments and extracts from musical scores. 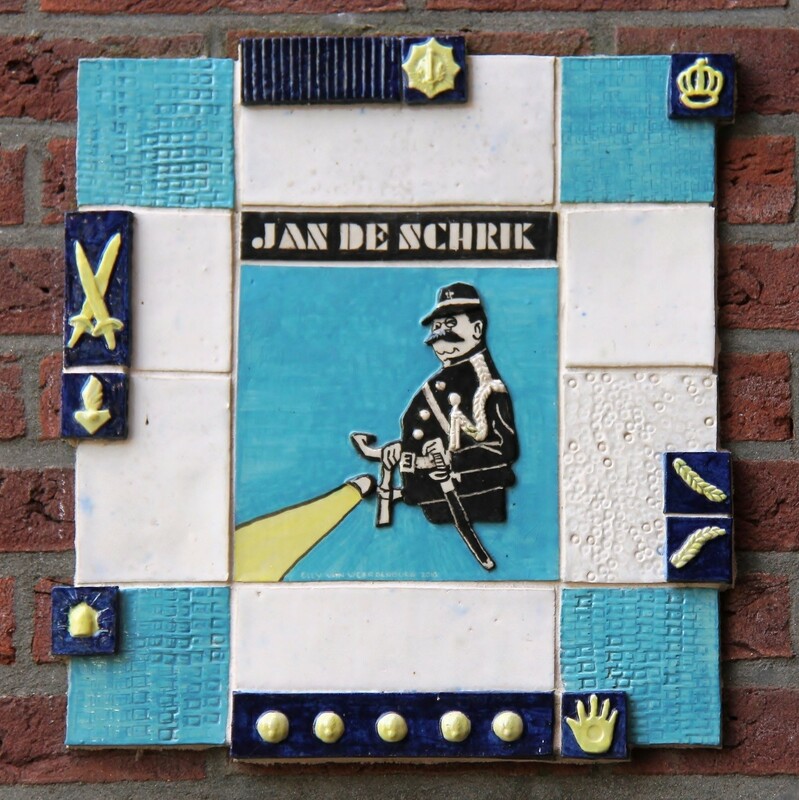 Local characters and famous people who lived in Lunteren are also remembered like Jan de Schrik, a well-known early twentieth century local policeman (veldwachter) who was responsible for law and order in the town. Elly van Weerdenburg, the designer of the panel, shows Jan de Schrik in police uniform with a sabre hanging from his belt and holding the handle bars of the bike on which he would patrol the town. 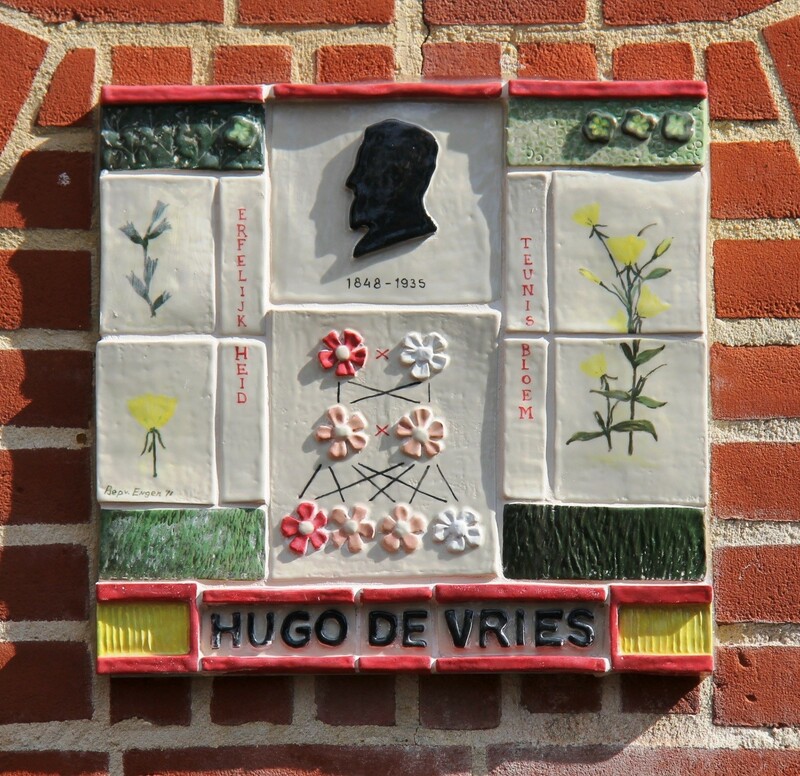 Another interesting tile panel by the artist Bep van Engen commemorates the famous botanist Hugo de Vries (1848-1935). De Vries taught botany at the University of Amsterdam and is best known for developing the concept of genes by studying mutations in flowers. He spent his long retirement in Lunteren continuing his writing and his botanical studies. Much of his research is based on the study of the evening primrose (Oenothera Lamarckian) which grows wild in the meadows around the town. In Dutch this flower is known as ‘teunis bloem’ and is shown on the tile panel. At the bottom of the panel there are a red and a white flower that mutate by cross fertilisation into pink flowers. The Dutch word ‘erfelijkheid’ on the panel means ‘genetics.’ This panel is a good example of iconography where the observer has to ‘read’ the imagery with a certain amount of background knowledge in order to understand what is being shown and make the correct interpretation. The Lunteren tile project is still ongoing. At present, the artist Wim den Hertog.is engaged with a tile project in a primary school in Lunteren where the children are making individual tiles which will be made into a tile panel for a new housing scheme in the town. This all demonstrates that with the right network of artists and local people, tiles can be used as an innovative form of public art that enhances the built environment with durable images that add colour, and conveys information about the present and links with the past. The route of the Lunteren tile trail can be accessed on line by accessing the following link: http://www.lunteren.com/nl/Tegeltableaus-route/Routes/Wandeling-Wekeromse-Zand-HHG This can be printed beforehand or ‘read’ on-line on a smart phone and allows visitors to follow the trail through the town on a walking tour of tile discovery.